We offer many different types of bookings! Some clubs who already use our system. WebBookings is the easy and affordable bookings system for Sports Clubs to allow courts, pitches, fitness classes and table reservations to be booked Online. 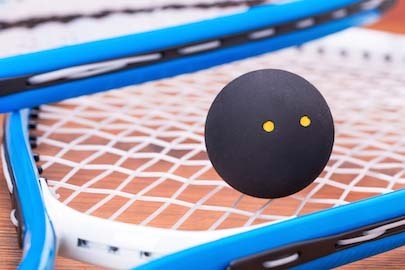 Make bookings for squash, tennis, badminton, fitness classes, aqua classes, five-a-side football, MUGA facilities, hockey, bowling, or any other sports your club offers in addition to table reservations at your restaurants. 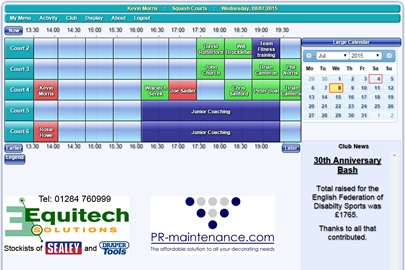 Make block bookings for team matches, maintenance or regular coaching sessions. Specialist booking types include lessons and courses. We can also integrate club and county leagues and tournaments. We take the hard work out of setting up and maintaining an online bookings system and could have you up and running in just a few hours. There's no need for specialist expertise or computer hardware. Our fully managed service means all you need is a computer and an Internet connection. Prices are normally £10 per facility per month (e.g. 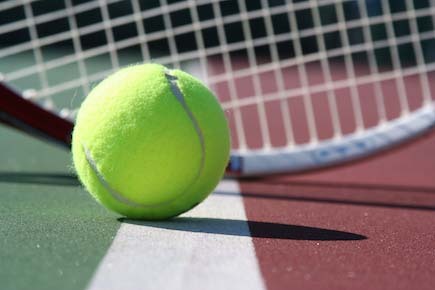 court or studio) or £5 per court per month for outdoor tennis courts that are only used for part of the year. Table reservations are £40 per month. Full pricing details are shown below. Your members and guests will be able to book courts and classes 24 hours a day, 7 days a week from the comfort of their home computer or phone. Low all-inclusive monthly fee. No upfront investment in hardware or server costs necessary. We maintain your data on a secure server with a track record of 99.9% uptime. Both the member and staff interfaces are quick and easy to use without training. 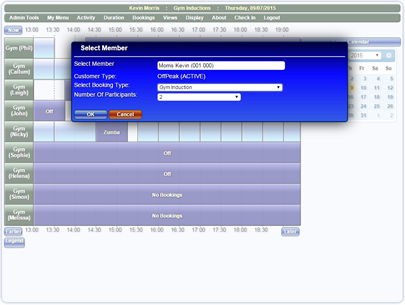 You can use any web browser to make and manage bookings. We have mobile phone apps for Windows and Android with iPhone coming soon. The WebBookings system is fast and simple enough for a busy reception, it also allows you to track no-shows, payments and arrears, if relevant. The system can incorporate a card swipe system to check members in and record attendance for different activities. We also link directly to DoorGuard, an internet connected door entry system. 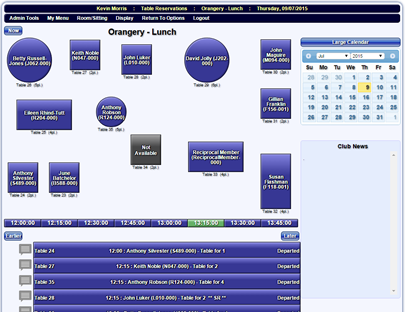 The Members' WebBookings interface can also be used at the club with a touchscreen computer or monitor to allow customers to book their courts or classes while at the club or directly after a match or class. The Members' interface also has the option for customers to check in before playing their match. This potentially saves time for busy reception staff. 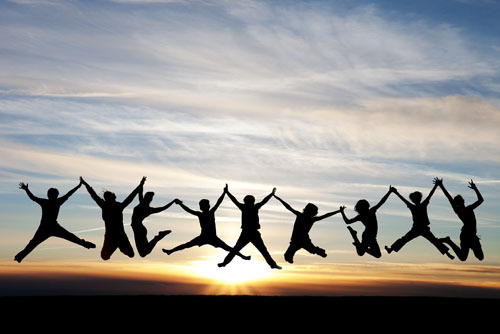 Users can pay for court and membership fees through our system. Your club would need to setup an account with either WorldPay or GoCardless. WorldPay accepts online card payments while GoCardless sets up online Direct Debits which are automatically debited from WebBookings to top up user accounts and/or pay monthly or annual memberships. Automatically turn on and off lights on a court before and after a booking is scheduled. This can save significant amounts on your lighting bills. We provide the software and internet control switches, while the wiring is arranged by the club. Users can receive booking confirmations, cancellations, and reserve notifications on their mobile phones via SMS. You can also send messages to different groups, e.g. 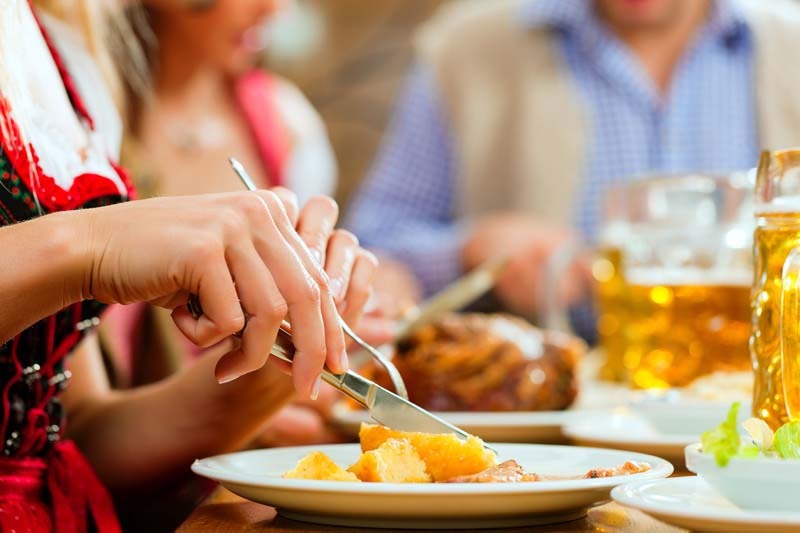 the entire club, customer types, attendees of a class or individuals. Each message costs 7p. Give member groups different permissions as to when they can book and which sports and tables they are allowed. Many different rules can be applied including 'on the day bookings', bookings per day, different costs for different member types etc. All login details and personal information is encrypted for the safety of all our users. In addition to the user and reception interfaces, Administrators can do everthing from creating and cancelling bookings to settings up block bookings, lessons, and courses. They can add/edit members' details, produce usage reports, send global emails, change customer and membership types and change setup options for the club. Post updates and news about the club for the convenience of your users. You can also upload your club rules which are then available via the main menu. Global emails and SMS are available to help spread the word. All login details and personal information are encrypted for the safety of all our users. 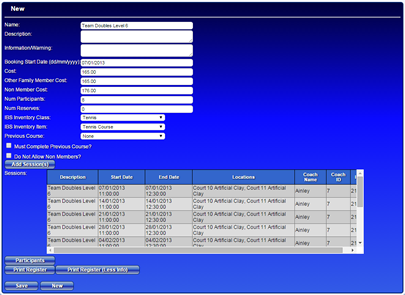 Individual Bookings, reserves the slot and locks out the court and time from other users. 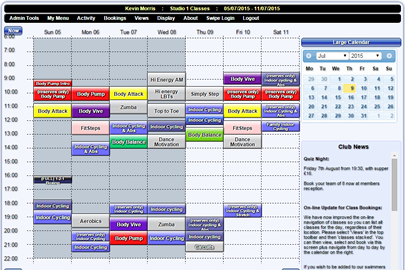 Sign on to weekly classes and group sessions. Reserve slots can be booked and members are informed of promotion to a full booking by SMS or email. Sign up to courses that run for a set number of weeks. 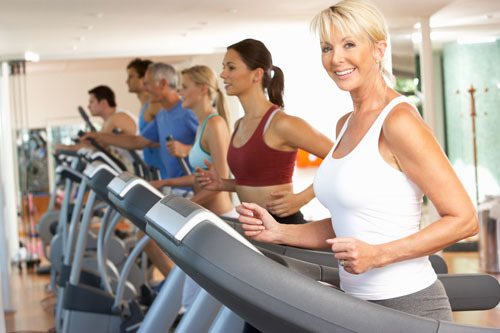 Individual sessions may swap between sports to give members a taste of everything the club offers. Book a one off session with an instructor. Payments can be to the coach or to the club or a mixture of both. Members can book tables online. Staff can view table status at any time, e.g. arrived, ordered, sat at table, left etc. Can view as time slots or as plan view. We have put together some quick demos which show some of the main functionality of the software from a member's and administrator's perspective. 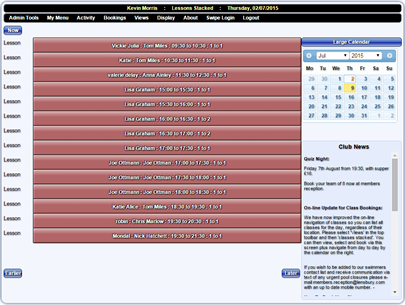 x clubs are already using us!There are y active users in our systemWe helped users make z bookings so far. If you are in need of any work on your squash courts Melior Squash can help.